^ The Maryland companies included selected members of the Delaware Line. Alden, Henry (ed) (1879). Harper's New Monthly Magazine, Volume 59. Harper and Brothers. OCLC 1641392. http://books.google.com/books?id=B8gaAAAAYAAJ&pg=PA240#v=onepage&f=false. Johnston, Henry Phelps (1900). 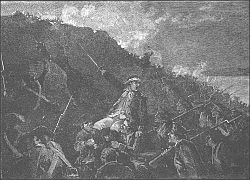 The Storming of Stony Point on the Hudson. New York City: James T. White & Co.. http://books.google.com/books?id=DzhCAAAAIAAJ&pg=PA29#v=onepage&q&f=false. Loprieno, Don (2004). The Enterprise in Contemplation: The Midnight Assault of Stony Point. Heritage Books. ISBN 978-0788425745. Nelson, Paul David (1990). William Tryon and the Course of Empire: a Life in British Imperial Service. UNC Press. ISBN 9780807819173. http://books.google.com/books?id=CPtiZBAufk4C&printsec=frontcover. Pancake, John (1985). This Destructive War. University, AL: University of Alabama Press. ISBN 0817301917. Rankin, Hugh (2005). The North Carolina Continentals. Chapel Hill, NC: University of North Carolina Press. ISBN 9780807856628. OCLC 62408088.